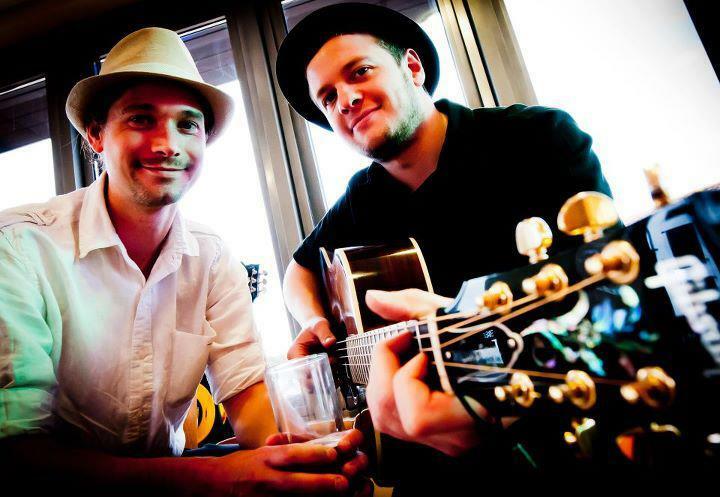 The Acoustic Duo are a professional acoustic covers act with many years of experience on the wedding, corporate and function circuit in Bristol, Bath, the South West and further afield. The duo are impressing audiences across the country with their unique take on rock and pop classics such as The Cure’s ‘Friday I’m In Love’ or Norman Greenbaum’s ‘Spirit In The Sky’. 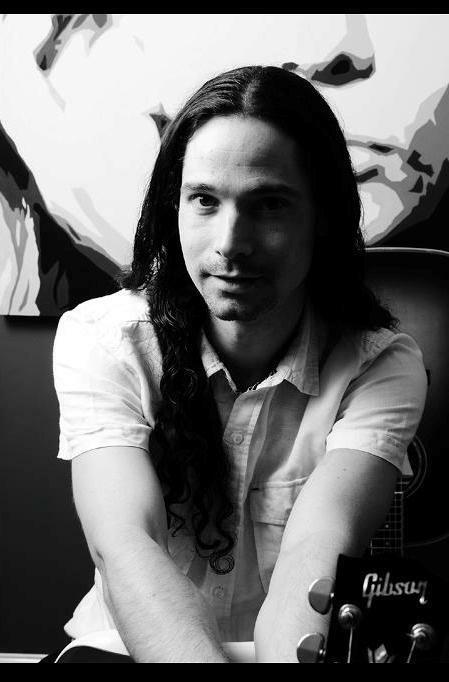 Their quality acoustic set also takes in 80’s pop-rock like Michael Jackson’s ‘Leave Me Alone’ and Bon Jovi’s ‘You Give Love A Bad Name’, as well recent alt-rock hits like The Killer’s ‘Human’, complemented by selections of a more laid-back vibe including faithful renditions of Beatles and Beach Boys standards. 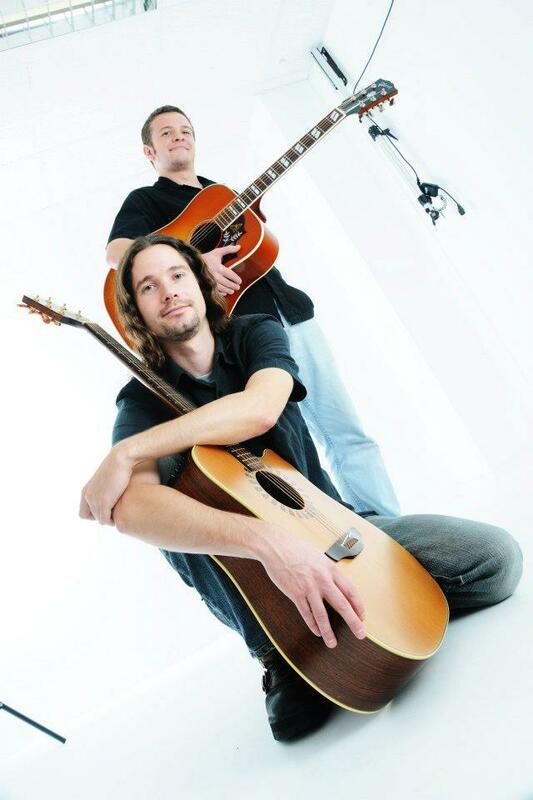 The Acoustic Duo have a large and varied repertoire of popular songs, delivered with skilled guitar interplay. 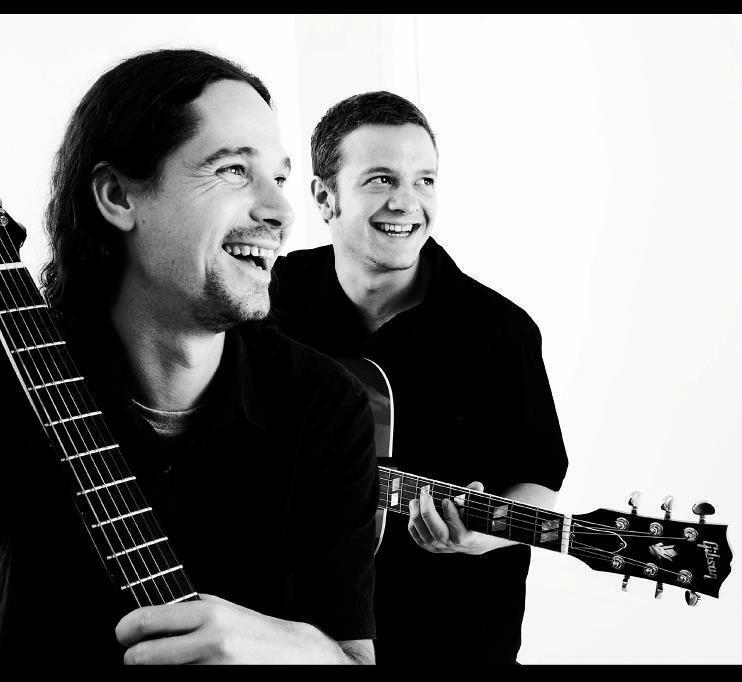 The Acoustic Duo’s twin acoustic guitar sound and vocal harmonies are ideal for a wedding or birthday party. They are equally suited to a two hour party performance or an intimate after dinner session. The duo is made up of Alfie, a singer/songwriter with airplay on BBC Radio 2, and Chris Webb, a talented young musician who recently released his first EP on the back of a well-received performance at the nationally famous Bristol Harbour Festival. Whatever the reason for hiring a live band you can count on the versatility of the duo’s sound and on their professionalism. The duo provide their own quality P.A. system, engineering and lighting rig, as well as a comprehensive and tailored DJ service playing a mix of classic songs from over the decades through to the present day. The Acoustic Duo can perform for up to 3 hours. The Acoustic Duo played a live acoustic set and provided a DJ service at our wedding on August 21st, 2010. They were extremely professional, both in the lead up to the day and on the day itself. This is despite having to work with us remotely in Dubai via email to organise things and then enduring some pretty horrendous weather during set up on the day. The Acoustic Duo made the effort to find out what kind of music we liked and did a great job both playing a live set (their version of The Killers – Mr. Brightside, learned especially for our first dance, was fantastic), and providing an excellent mix of tunes later on in the DJ set. The Acoustic Duo were professional, prompt and personable throughout and I would definitely recommend them to others looking for talented musicians for an event. Many thanks for helping make our big day so special. Top acoustic act. Two contrasting personalities combine to give you a fantastic and entertaining evening out. When The Acoustic Duo turn up, you know you’re going to have a good night. The simplicity of their arrangement, the skill of delivery, the choice of material and the quality of their sound leave most other acoustic duos in the dirt. You can’t beat a bit of Bristol stage-banter either! The Acoustic Duo are a fantastic acoustic act. Our Cricket Club booked them for a dinner and dance and the guys did a brilliant acoustic set – lots of well-known covers, older ones for the wrinklies and plenty of new stuff for the kids. They followed that with a DJ session as we danced the night away. Looking forward to seeing the duo again very soon. This duo offer a superb range of cover versions which will appeal to all ages. 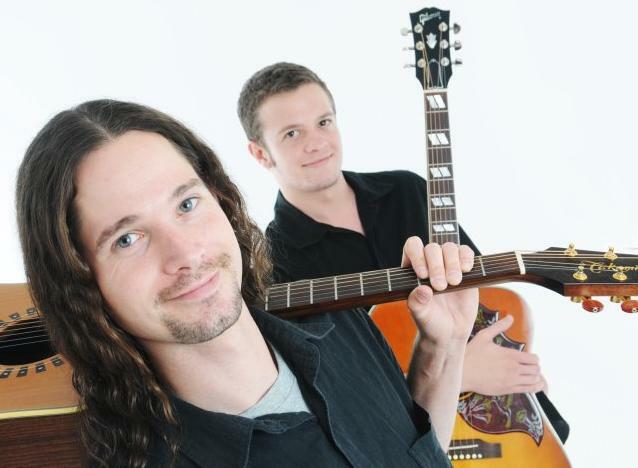 With a highly polished quality of performance,The Acoustic Duo will guarantee you a wonderful night of music. The Acoustic Duo played a great mixture of music and kept us happy and dancing! Everyone enjoyed them and we would book them again in the future. The duo were excellent. They provided fantastic live music and were then very happy to provide a disco later on in the evening. They were really good at providing the correct atmosphere and we have had some really good feedback. I would definitely recommend them. A brilliant choice of band to have at our mini festival, the quality of music, the entertainment value and professionalism all came through. All our guests enjoyed the music and we would definitely use them again! The duo were very professional and arrived punctually and smartly dressed. It was a great day for the store and the duo played for twelve hours over two days, receiving many compliments from our customers. I would certainly recommend them as a talented professional set-up who can adapt their set and style to play anywhere. We wanted to thank you for the fantastic performance at our wedding at the Larmer Tree Gardens. You were extremely pleasant to deal with and instantly on speaking to you about the booking I felt really pleased about our decision to book your duo. I really hope you both enjoyed playing on the stage, we had so many comments from guests who loved your set, it was perfect for what we imagined. Thank you again for making our day so special. We both really enjoy our music and love live music so it was such an important thing to find a band who could make the most of the venue. You really did, so thank you. I have received so many great comments about the party. Everything went well, the venue, the food and especially the music, even my very trendy sons thought you did a fantastic job. I couldn’t believe it when you said it was 12:30, the evening went so quickly. Four Non Blondes – What’s Up? Joan Osbourne – What If God Was One of Us?